Bach, Gora-Bach, Vacha, Ugragandha, Ugra, Sadgrantha, Acorus calamus, calamus root, flag root, myrtle flag, sweet flag, calamus. Sweet flag, or calamus has been used since ancient times, however modern misuse of the root oil has given rise to concerns over its use. 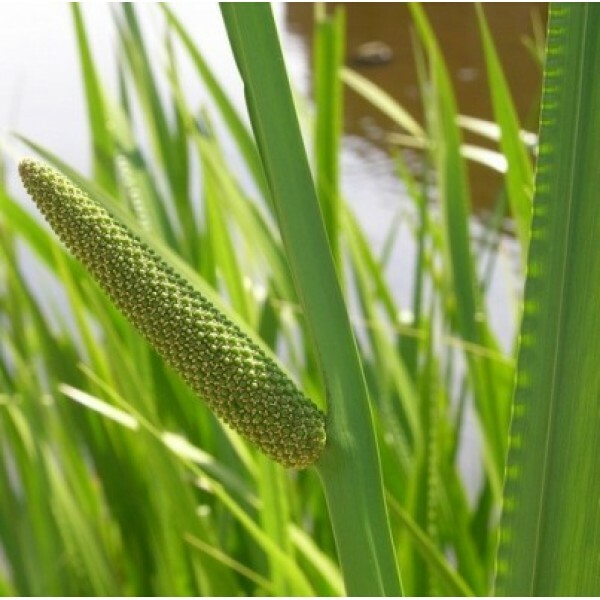 Traditionally calamus was used for its effects on the digestive system and the lungs. This herb eliminates phlegm, clears congestion, and tranquilizes the mind. Traditional uses include :amnesia, heart palpitations, insomnia, tinnitus, chronic bronchitis, and bronchial asthma. The root oil is strong and fragrant, its taste warm, bitterish, pungent and aromatic. Its active principles are taken up by boiling water. It is a thick, pale yellow liquid, and has a high toxicity. In Europe calamus is used as a digestive aid, helping to counter acidity and ease heartburn and dyspepsia. The root is also chewed to help toothache and to help stop smoking. Acorus can blunt gastric upset during the acute phase of drug withdrawal. Preparation Methods & Dosage: Traditionally taken as a tea, however internal use is not recommended for the casual user. Seek guidance from a herbal practitioner. Calamus may be used externally as a bath additive, or as an alcohol rub for sore muscles and circulation. Amenorrhea, Aphrodisiac, Asthma, Ayurvedic, Colds, Congestion, Headache/Migraine, Sore Throat, Stop Smoking. Abortifacient, Analgesic, Antibacterial, AntiCancer, Antioxidant, Antirheumatic, Aromatic, Bitter, Carminative, Diuretic, emetic, Emmenagogue, Nervine, Psychedelic, Sedative, Uterine Tonic.